It's May!!!! In Memphis that means sun, fun, festivals, and none other than what we're famous for: BBQ! I tell every out of town friend I have, if you visit Memphis, make sure it's in May! Every weekend, there's something fun going on, but the biggest weekend yet is the World Championship BBQ Cooking Contest! Tents line Tom Lee Park along the river with the smell of BBQ in the air. The entire week is one big party and some serious competition! Tres and I go every single year, spending a lot of our time at our good friends' tent, Pigs Gone Wild. Those guys are a blast, and to go along with them having a tent bursting with celebration, they can also cook some mean BBQ! BBQ Fest... It's literally the BEST WEEKEND IN MEMPHIS! So in honor of the weekend coming up, I'm doing my own version of ribs. Cocoa-Cola Ribs are exactly what they sound like... A little bit of chocolate and a little bit of Coke make these guys sweet, hearty, and will always make me think of the city I live in and love! 1. Rinse the ribs and pat dry with paper towels. Mix the cocoa, brown sugar, salt, liquid smoke, all spice, paprika, and pepper together in a bowl. Rub the mixture onto the ribs and press to adhere. Cover ribs and refrigerate for a few hours or overnight. 2. Heat oven to 325 degrees. Prep two baking pans by pouring 3/4 cup of coke into each pan. Add the chopped onions over the coke. Place the ribs on top of the onions. Cover the pan tightly with foil. Roast for 2 1/2 to 3 hours or until meat is tender and almost falling off the bone (I like my ribs to still have substance to them.. Not quite falling off the bone). 3. 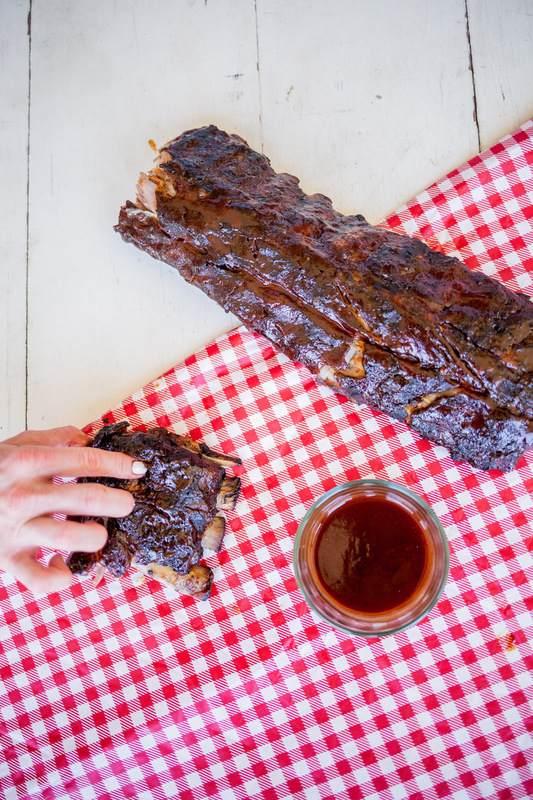 Using tongs, move ribs to a baking sheet lined with foil. Strain the onions from the coke. Reserve 1/4 cup of the coke and mix with barbecue sauce. 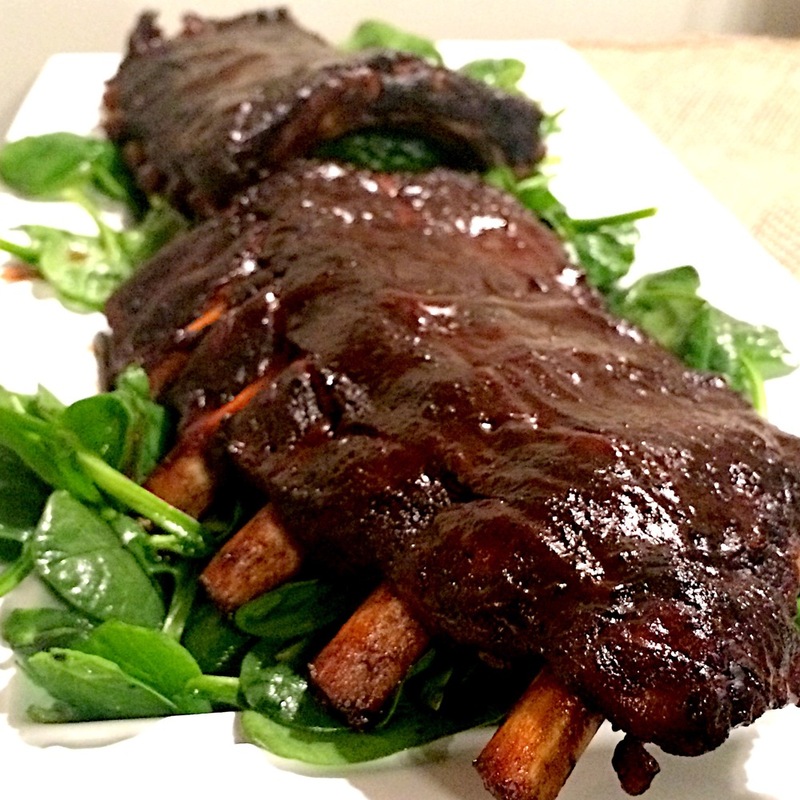 Brush a thick layer of the sauce onto ribs. 4. Put ribs back in the oven for 20 minutes. Serve with the extra cola-barbecue sauce on the side!